Chip Miller and Scott Conrad are both originally from the East Coast but met for the first time more than 4,000 miles from home, in Alaska, where they both worked in the Alaskan fisheries industry. While the thought of becoming partners in a boat building venture was the last thing on their minds at the time, a life-long friendship was formed that would later become the foundation for Six River Marine. Years later, Scott and Chip met up again in the Boston area where they were doing carpentry work. Scott continued with this and then moved into the craft of fine furniture making. Chip headed to Maine where he studied boat building at the Maine Maritime Museum. Following his apprenticeship, Chip worked at Dion's Yacht Yard and then went on to work with well known Maine boatbuilder Peter Kass and finally, to the yard of H&H. In the early 90's, Scott and his family moved to Maine where he continued to work as a furniture maker. 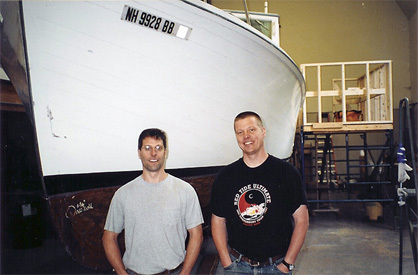 In 1994, Scott and Chip decided they'd like to join forces and work together as boatbuilders, working primarily with customers who needed work done on their wooden boats. As is the case with most independent boatbuilders, the business started out small. They packed their tools in a van and set about letting folks know of their services, driving right up to the customer's location and working wherever the boat happened to be. They had to work in some fairly miserable conditions during this time but they were doing what they loved and their reputation for fine craftsmanship, honesty and integrity grew with every job. Today, Six River Marine has grown to occupy a 15,000 square foot facility on 3 1/2 acres in North Yarmouth, Maine. Chip, Scott and their crew perform major restorations, repairs and new builds on boats for both recreational boaters and commercial fishermen. While the business has grown significantly since its humble beginnings, Scott and Chip haven't lost sight of the core values they first established for their business; to efficiently provide their customers with finely crafted work that ensures lasting value.